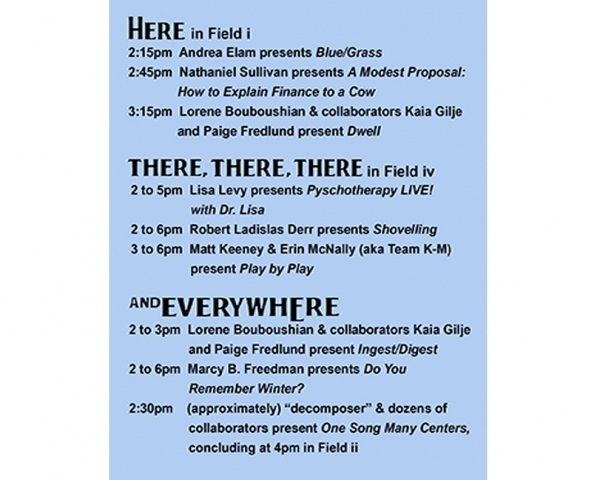 After several years as Curator of Performance Art on the Farm, I faced a new challenge: how to organize a program of 8 performances in one afternoon in a manner that would allow visitors to the 140-acre farm to attend each and every performance? My solution was this: I employed a spatial and conceptual framework called “Here, There, There, There, and Everywhere.” Accordingly, the three brief, scripted performances were held in one area called HERE. Each of the three longer pieces (running 3 to 4 hours) was allotted its own specific location called THERE. 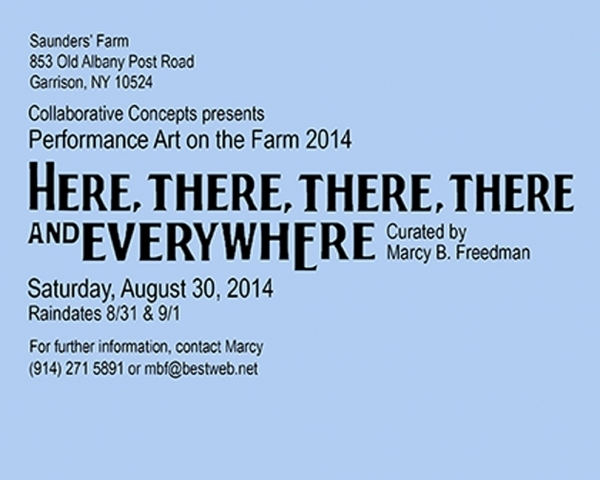 Finally, there were performers who chose to wander around broad areas of the farm. In other words, those performances took place — EVERYWHERE! As in past years, I was able to bring great diversity to the line-up, demonstrating the range of the performance art genre. Dance performances were presented by soloist Andrea Elam and a group consisting of Lorene Bouboushian, Kaia Gilje, and Paige Fredlund. A spoken word piece was presented by Nathaniel Sullivan. Interactive projects were brought to the farm by Lisa Levy, Team K-M (aka Matt Keeney, Erin McNally) and me. An extremely labor-intensive performance was completed by Robert Ladislas Derr. Finally, the group called “decomposer” enlisted the help of dozens of collaborators to share a moving (literally and figuratively) musical presentation.